On Friday morning, an hour before the exhibition hall opens at 10am, PAX Unplugged lets media members in for an early sneak peak of the spectacle of the myriad vendors. This recap will not be about my early access to PAX Unplugged, as I was putting my son on his school bus in New York at that time. Family first, you know? That said, I wouldn’t have traded that early access for my ride down with three local gaming buddies, who picked me up on their way down to Philadelphia. It’s funny, though I’d met each of them a number of times at various game stores and local events, I really feel I got to know them a lot better during our car ride down than I ever did in years gaming with them. When I did arrive at the Pennsylvania Convention Center, the first new thing I noticed was a line for metal detectors that was not there last year. Since I was walking in at around 1pm, this was not a huge issue at that time, but at other points during the convention, it would become one -- making me late for a scheduled game demo, and paranoid to leave for better food in Reading Terminal or Chinatown due to the monstrous line to re-enter the convention space. Once in the main hall, I wandered the different vendor stalls, catching up with some people as I went, until I made it over to the Brain Games booth for a review copy of Ice Cool 2. I cannot wait to mix this in with the first game for an epic game of penguin-flicking family fun. I kicked myself more than once for not bringing Ice Cool with me, so I could have made this happen at PAX Unplugged. Live and learn. I then stumbled into D. Brad Talton around the corner at the Level 99 booth. I knew they had just announced a new stand-alone Exceed that would feature the characters of the classic arcade franchise Street Fighter, but I did not know they would be demoing it -- until he offered me a chance to play. If you know me, you know I love two-player tactical dueling games, with Summoner Wars being an all-time favorite. Add in the fact that I’m the exact right age for peak Street Fighter nostalgia, and boom, I was amped for this game. I’ve enjoyed Level 99’s other similar line of games, like BattleCON, but this blew that system out of the water. 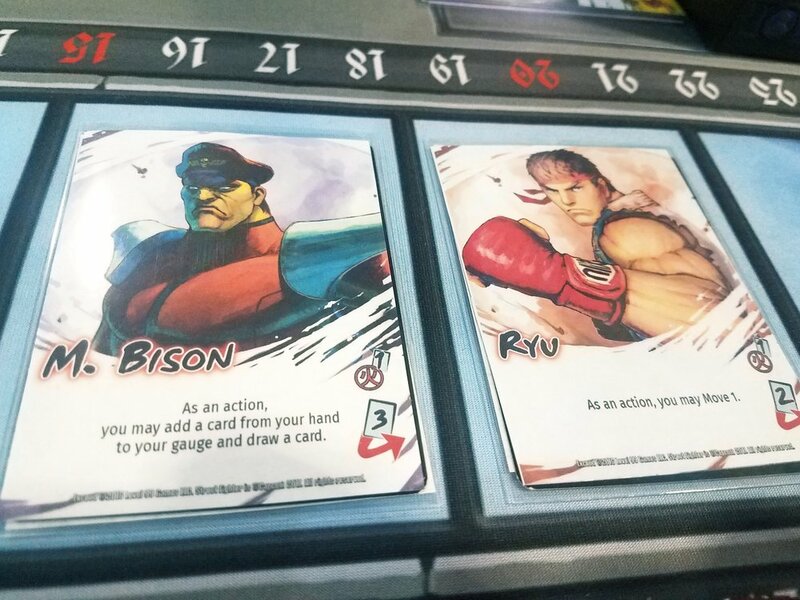 Exceed: Street Fighter was so quick, so intuitive, and such streamlined fun, that I walked away thinking I may have just played my game of the convention, all of fifteen minutes after I’d showed up. This is, of course, a good problem to have at the beginning of a convention. Wandering around the hall further, I found Jake Bock of the Draft Mechanic podcast demoing City of Gears at the Grey Fox booth, and he was able to get me right into a game. The game looked good, and played smoothly, but for whatever reason didn’t hook me. I’m glad I tried it, and I see the appeal of it, but it wasn’t something I felt the need to explore further. This is a feeling I’m experiencing more and more, and I think it may have to do with the overwhelming amount of games coming out each year -- new games have such a high bar to grab and maintain my interest these days. On a related note, I happened past a booth that was showing off Jasco Games’ new Cowboy Bebop: Boardgame Boogie, and while it initially got my attention because I absolutely adore the theme, it didn’t hold my interest whatsoever once I saw what a generic-looking cooperative game it looked like beyond the beloved theme. Sigh. After a good deal more wandering around, I found Conor McGoey -- in full gladiator costume, no less -- all the way in the far corner of the hall. Here, at the Inside Up booth, I picked up a deluxe copy of Gorus Maximus. Let me tell you, calling it a deluxe card game is no hyperbole, as it has plastic linen-finished cards with gold foil edges, a metal sword to mark trump, poker chips to mark tricks won, and its own plastic deck box for more portable play. It became my most played game of the con, as I busted it out in front of multiple different groups over the course of the weekend -- with everyone enjoying its stylized artwork and chaotic gameplay. With 6pm approaching and the exhibition hall closing for the day, I met up with my friend Manny, a Philly local, and Jake, who had just finished his demo shift with Grey Fox, and we headed to Chinatown for a delicious meal. Most surprisingly, though, considering it was Friday night in downtown Philly, we didn’t have to wait to be sat. Which was good, because the three of us had a game demo to get back to in the open gaming space at 7:30pm. Which we would have been in time for, if not for the unbearably long security line at the metal detector to get back into the convention center. We made it -- fifteen minutes late -- to our appointment with Evan Halbert and Ryan Mauk, the designers of After the Empire, who were showing their game off in the First Look area of the hall. 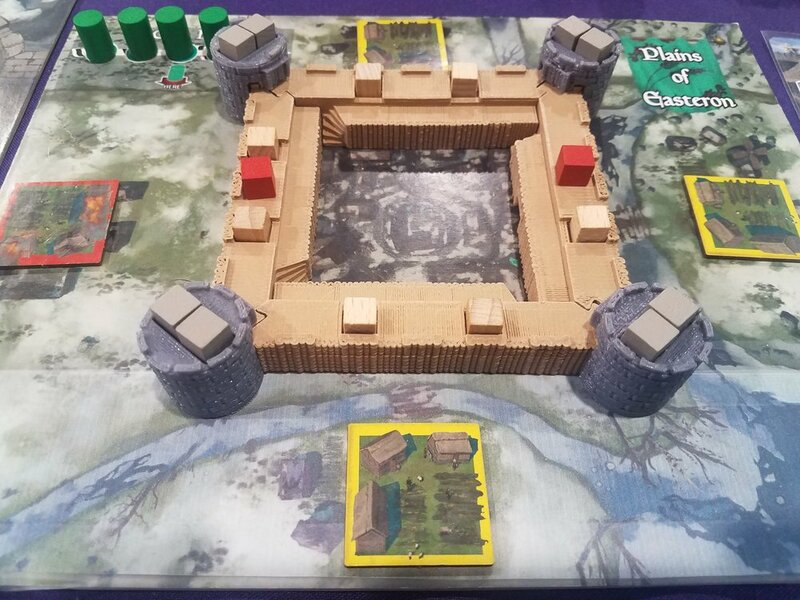 After the Empire is a combination of worker placement and tower defense, where each player is competitively building and defending their own little fiefdom. It was the longest and heaviest game I played over the weekend, but it did not drag at all, playing quite smoothly with three new players after a front-loaded teach from the designers. Plus, we literally got to build three-dimensional castles with walls and turrets, and filled them with little cube soldiers, which was just a satisfying feeling. This is coming out from Grey Fox next year, and I suspect it is going to be a big hit, both due to its engaging gameplay, and its remarkable table presence. At different points while we were playing, Nate Bivins, designer of Sundae Split, and Tim Eisner, designer of Tidal Blades, popped over to watch and chat with us, so it seemed like the First Look section of the hall -- in addition to having a lot of hot recently released games, such as Azul: Stained Glass of Sintra, and upcoming games, like Pipeline, available to play -- was a good place to see and chat with a plethora of different game designers. After wrapping up our After the Empire game, Manny and I headed over to what I have a feeling will be called the Infamous Whiskey Night of PAX Unplugged, which was in the lobby of the Home2 Suites across from the convention center. When I opened the door, I was hit hard with the distinct odor of a distillery, and saw over a hundred industry people and gamers from the convention, along with dozens of open bottles of all kinds of whiskey -- Irish, Canadian, Kentucky bourbon, and many more. I mingled and had the chance to chat with Chris from Game All Nite, Ian Zang from Breaking Into Board Games and Deepwater Games, Floodgate Games’ Gates Dowd, and designer and Maple Games founder Daryl Andrews, among many others. I also set up a demo of Imagineers, which was entering the final stretches of its Kickstarter campaign, with Daryl for the following day. Then I met up with the guys I’d driven down with and taught them Gorus Maximus, which was perfect for the loud raucous party we were in the middle of. By the time we wrapped up our game, it was getting late, and the party was starting to empty out. We decided we had one last game in us, late hour be damned, so I broke out Architects of the West Kingdom and taught that to them. The game, despite the late start and the long day, went over really well. I still prefer Raiders of the North Sea, but I like the unique approach Garphill Games took with worker placement in this first entry in the new series. At the end of this one, it was near 3am, and I walked back, bemused and bleary eyed, to the Marriott and turned in for a few hours shuteye before Saturday’s shenanigans. Continue reading: The Cardboard Hoard: PAX Unplugged Recap - Saturday; or Where Does the Time Go? 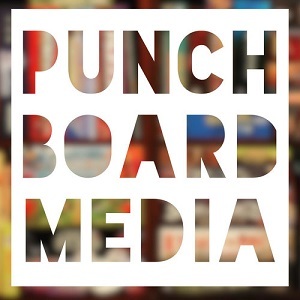 Dec 27 The Cardboard Hoard: PAX Unplugged Recap - Saturday; or Where Does the Time Go?